Fake news – deliberate misinformation or hoaxes spread via traditional print, broadcasting news media, or via social media – gained global prominence as a result of the 2016 US presidential election, which, according to political observers, was influenced by this relatively new phenomenon. With increasing numbers of people sourcing news content through social media, Facebook has become one of the main channels through which fake news can ‘go viral’ and reach huge audiences. In recent months, Facebook has taken action to improve the monitoring and reporting system to crack down on the problem of fake news after accusations it has not done enough during the US presidential campaign or in the run up to the Brexit referendum in UK. 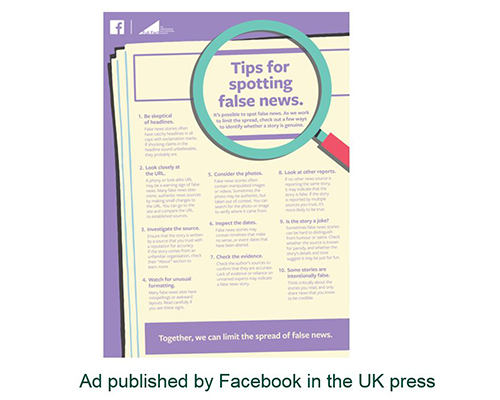 In the run-up to the UK general election, Facebook broadened its campaign to raise awareness about fake news by placing the adv shown below in the UK press on May 8th, including The Times, The Guardian and Daily Telegraph. The ad shows a list of 10 things to look out for to help people decide if content is genuine. 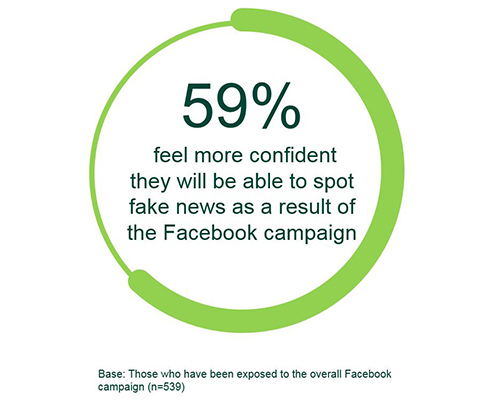 Harris Interactive decided to launch a Harris 24 poll on May 10th to measure the impact the Facebook campaign about fake news in the UK press. Levels of recognition decrease with age: 45% of 18-34 year olds recall seeing the ad, 35% of 35-54 year olds and just 23% of people aged 55 or above. This finding might appear counterintuitive since the ad was placed in the print media, which is more popular among an older demographic. However, we need to bear in mind that the print ad was part of broader Facebook marketing campaign across a range of media, and that the topic of fake news has become more prominent in public debate in recent months, generating higher visibility for the Facebook initiative. As a consequence, we see that the main source of awareness of the advertisement was the internet, which is typically more used by young people, followed by TV and newspapers. 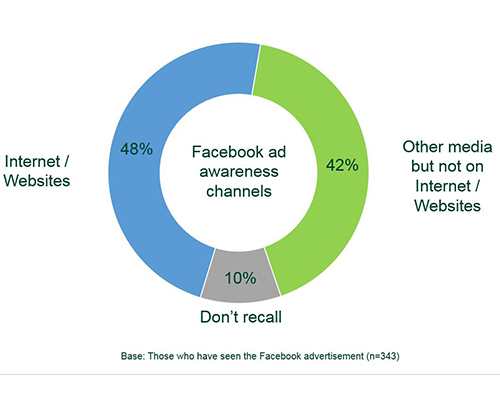 Our results suggest that traditional media overall were key to extending the reach of the campaign with 42% of those recognising the ad claiming to have seen it somewhere other than the internet. The campaign was not only about raising awareness of fake news but also about providing a list of 10 tips to enable people to spot fake news. When asked about this aspect, nearly 6 in 10 stated that the Facebook campaign increased their confidence of spotting fake news. Facebook’s apparent willingness to tackle the fake news issue came after strong mediac and political pressure which might have had a negative effect on it own brand reputation.. 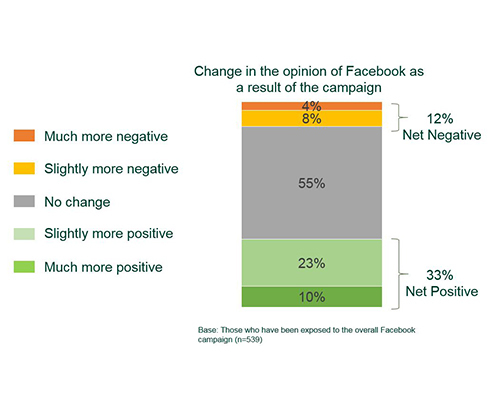 Therefore, we measured the impact of the campaign on the Facebook brand perceptions and we found that there was quite a positive shift: nearly 1 in 3 have a better opinion as a result of the campaign, while 55% have the same opinion and just 12% are more negative. In line with expectations and with the results discussed above, the improvement in terms of brand favourability was higher among 18-34 year olds (38% vs 29% for older people). 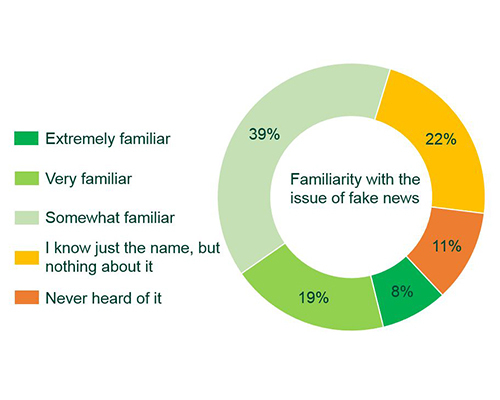 Despite marketing and political campaigns and strong media coverage of fake news, 1 in 3 in the UK have never heard of/don’t know anything about it. The incidence rises to 37% among women (vs 29% for men). 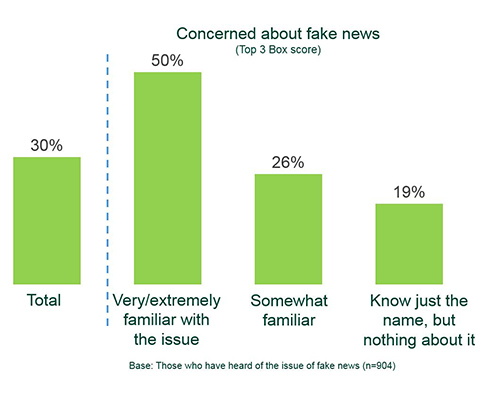 Less than 1 in 3 people are concerned about fake news. Even among those more aware of the issue, only half stated they are concerned, but we need to consider that people who consume more news are likely to use more than one source of information, which makes them feel less vulnerable to false news. The level of concern drops dramatically among those less familiar with the topic, suggesting that they might be less vigilant about fake news on the internet. 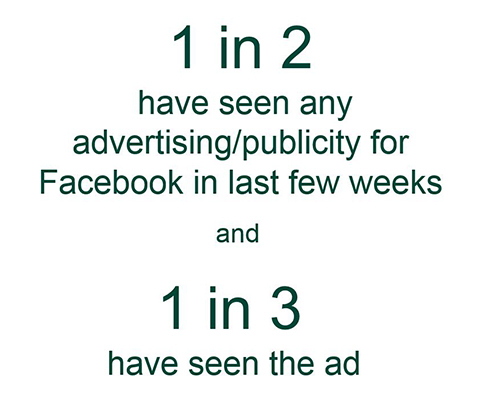 In summary, the Facebook campaign had a clear positive impact in terms of visibility and brand reputation, also providing practical tips which a majority found useful. 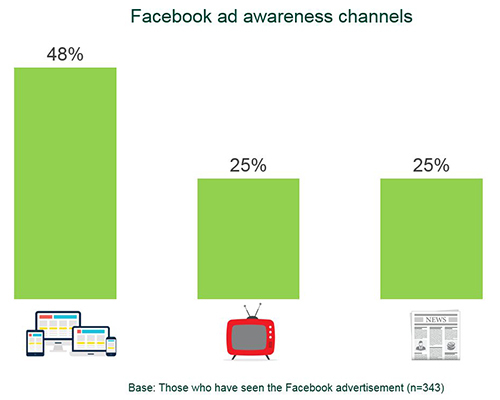 There appears to be a cumulative effect of all the marketing and media activities carried out by Facebook, with the print ads playing an important role in extending the campaign reach and also in generating a good amount of publicity on all the news media. However, a large part of the UK public are still unfamiliar with the issue and not concerned with it, which puts them more at risk of believing false news. That raises the legitimate concern that, despite efforts to tackle the problem, the forthcoming UK election might be influenced by fake news. And, in the long term, this is certainly an issue that is likely to become more salient in a media landscape where the news consumption is increasingly shifting from TV and print to social and digital news.